● Bruneian cuisine (汶萊料理美食) is the cuisine of Brunei. It is similar to, and heavily influenced by the cuisine of neighboring Malaysia, Singapore, and Indonesia, with additional influences from India, China, Thailand, and Japan. As is common in the region, fish and rice are staple foods, though beef is expensive and thus less common. Due to the predominance of the Islamic religion, the food is halal and pork is avoided. Alcohol is banned in Brunei. In rural areas, game animals such as wild birds, sambar deer, and barking deer are hunted. Dished from Brunei are often spicy, and are commonly eaten with either rice or noodles. Beef rendang, nasi lemak and puteri nanas, are popular foods in Brunei. Among the few dishes peculiar to Brunei is ambuyat, a sticky ball of flavourless sago starch, which is wrapped around a bamboo fork and dipped into a sour fruit sauce. Common drinks include coconut milk, fruit juice, tea and coffee. Food from many other cultures, such as Chinese and Indian, are present in Brunei. 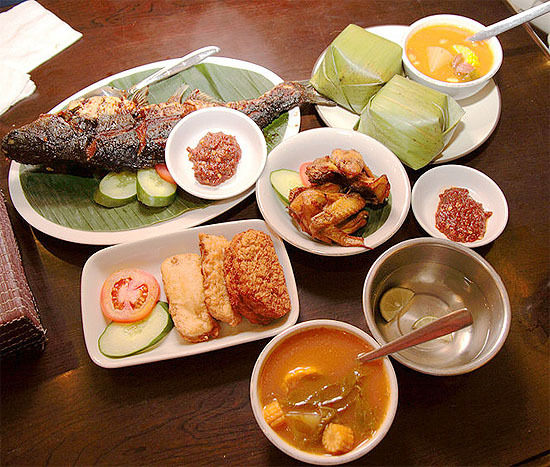 ● Indonesian cuisine (印尼美食) is diverse, in part because Indonesia is composed of approximately 6,000 populated islands. Many regional cuisines exist, often based upon cultural and foreign influences. 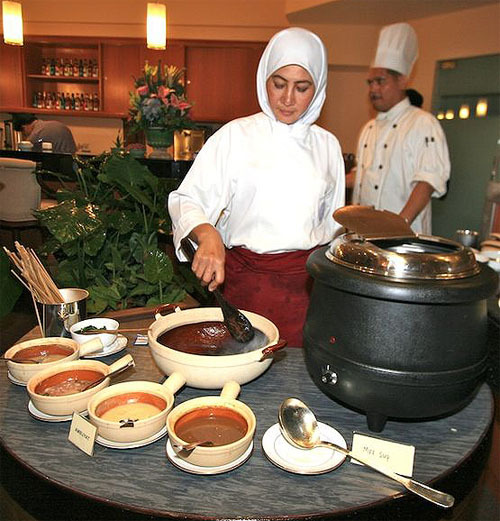 For example, Sumatran cuisine often has Middle Eastern and Indian influences, featuring curried meat and vegetables, while Javanese cuisine and Sundanese cuisine are more indigenous. Javanese cuisine (爪哇) is the cuisine of Javanese people. In wider sense, Javanese cuisine might also refer to the cuisine of the whole people of Java Island, Indonesia; which also include Sundanese in West Java, Betawi people in Jakarta and Madurese on Madura Island off East Java. Minangkabau cuisine (米南卡保), also known as Padang food, is the cuisine of the Minangkabau people of West Sumatra, Indonesia. It is among the most popular food in M​aritime Southeast Asia. It is known across Indonesia as Masakan Padang. Sundanese cuisine (巽他) is the cuisine of Sundanese people of West Java, Indonesia. In Sundanese restaurants, it is common to eat with one's hands. They usually serve kobokan, a bowl of tap water with a slice of lime for handwashing. Chinese Indonesian cuisine (印尼華人) is characterized by the mixture of Chinese with local Indonesian style. Chinese Indonesian bring their Chinese cuisine legacy, and modified some of the dishes with addition of chili, santan (coconut milk), kecap manis (sweet soy sauce), and spices formed a hybrid Chinese-Indonesian cuisine. Some of the dishes and cakes share the same style as in M​​alaysia and Singapore which are known as the Nonya cuisine by the Peranakan. ● Khmer cuisine (高棉, 柬埔寨) is another name for the foods and cuisine widely consumed in Cambodia. The food of Cambodia includes tropical fruits, rice, noodles, drinks, dessert and various soups. ● Lao cuisine (寮國) is the cuisine of Laos, which is distinct from other Southeast Asian cuisines. Laos shares borders with neighboring countries and as a result, Lao cuisine has strongly influenced the neighboring cuisine of Northeastern Thailand (Isan) and some Lao culinary influences have also reached Cambodiaand Northern Thailand (Lanna). ● Malay cuisine (馬來) is the cuisine of Malay people of Malaysia, Indonesia, Singapore, Brunei and Southern Thailand. ● Malaysian cuisine (馬來西亞) reflects the multicultural aspects of Malaysia. Various ethnic groups in M​​alaysia have their own dishes, but many dishes in M​​alaysia are derived from multiple ethnic influences. Spices, aromatic herbs and roots are all used in M​​alaysian cuisine. ● Peranakan cuisine (峇峇娘惹 | 土生華人) combines Chinese cuisine, Malay and other influences into a unique blend. ● Philippine cuisine (菲律賓) has evolved over several centuries from its Austronesian origins to a mixed cuisine with many Hispanic, Chinese, American, and other Asian influences adapted to indigenous ingredients and the local palate. For more information refer to: Philippine cuisine; regional specialties. ● Singaporean cuisine (新加坡) is indicative of the ethnic diversity of the culture of Singapore, as a product of centuries of cultural interaction owing to Singapore's strategic location. The food is influenced by the native Malay, the predominant Chinese, Indonesian, Indian and Western traditions (particularly English) since the founding of Singapore by the British in the 19th century. ● Thai cuisine (泰國) can be described as four regional cuisines corresponding to the four main regions of the country: Northern, Northeastern (or Isan), Central, and Southern. A fifth cuisine is Thai Royal cuisine, based on the palace cuisine of the Ayutthaya kingdom (1351–1767 CE), which was influential upon the cuisine of the Central Thai plains. Each cuisine has similarities to foods and cuisines in neighboring countries and regions, including the Cuisine of Burma, Yunnan cuisine, Lao cuisine, Cambodian cuisine and Malaysian cuisine. ● Vietnamese cuisine (越南) is a style of cooking derived from Vietnam. Fish sauce, soy sauce, rice, fresh herbs, fruits and vegetables are commonly used. Vietnamese recipes utilize a diverse range of herbs, including lemongrass, mint, Vietnamese mint, long coriander and Thai basil leaves. (印尼美食) Food Sundanese Restaurant, Jakarta, Indonesian cuisine. -- Example of Indonesian Sundanese meal; roasted fish, nasi timbel (rice wrapped in banana leaf), fried chicken, sambal, fried tempeh and tofu, and sayur asem; the bowl of water with lime is kobokan. (buffalo skin cracker dipped in spice).